As we already reported in our mid-round article, Magnus Carlsen today scored a fine win today over 2735-rated Polish Grandmaster Radek Wojtaszek. 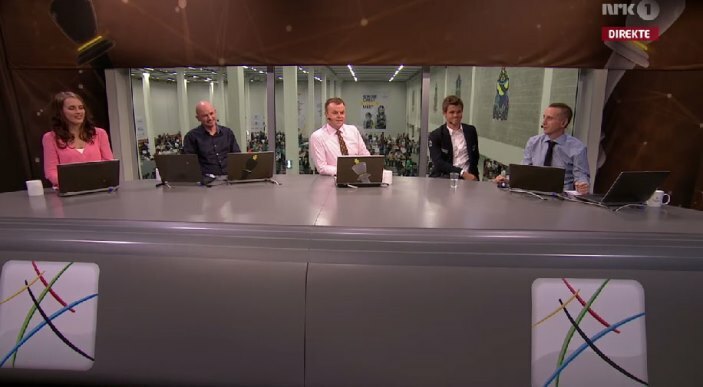 Afterwards he spent 35 minutes in the NRK television studio that overlooks the playing hall to talk about the game. Tarjei J. Svensen has translated what he said, some of which was quoted on the NRK website. I got a pretty nice game. Partly based on advice and partly based on my own experiences, I chose to play something less theoretical that has not been explored much. This is what happens when you are just playing from move 1, without any computer analysis. Then I thought I'd just outplay him from there, which was actually what happened. I managed to develop a nice initiative on the kingside and in the centre and he never got any counterplay. No, it's not only about intuition. 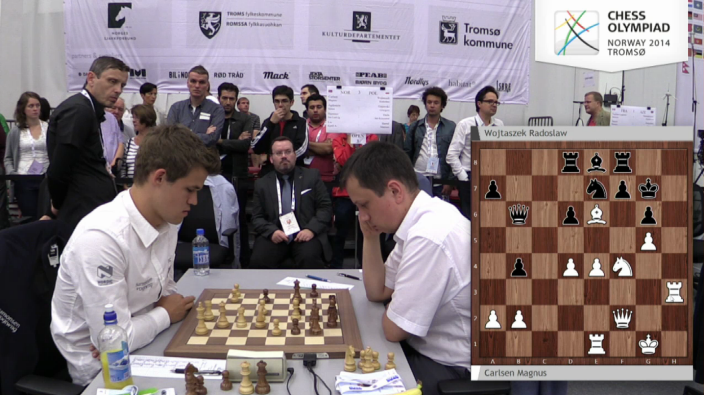 The main point is that Wojtaszek has been the second of Anand many times. His main strength is in the openings and he plays better in complicated positions than more closed positions. So I thought let's play something more closed and less theoretical, and take it from there. I just tried to play good chess. I felt pretty early that I had a comfortable position and he didn't quite know what he was doing. In the opening yes, but the rest no. Carlsen also said Kasparov was watching the game over his shoulder. …and he walked smilingly away. I think that's a move he would have made as well.